Half price currently at Argos. Help Marshall save the day in Adventure Bay with the Ultimate Rescue Fire Truck! Equipped with flashing lights and sounds, this rescue vehicle is ready for any action-packed mission. Use the crank arm to move obstacles and the extendable ladder to reach new heights - easy to activate, it lifts up, extends as high as 2 feet and rotates. Don't forget to use the launchers to help save the day! For Ultimate Rescue missions, get all 6 PAW Patrol pups to hop aboard the fire truck. Equipped with a 2ft extendable ladder, mini fire cart and light and sound features, this fire truck is ready for action-packed missions! Use the water cannon launchers on the front and back of the fire truck to put out fires! Turn the yellow dial or press the button to launch the cannons. 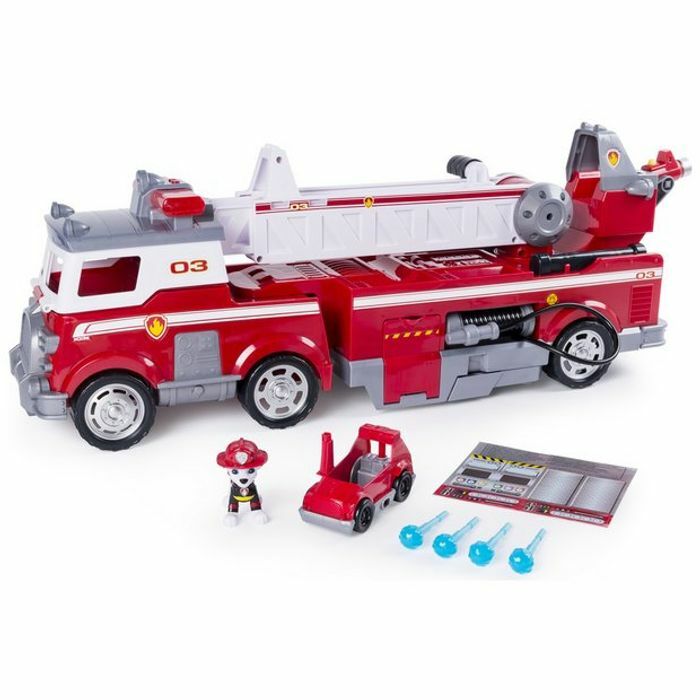 The Ultimate Rescue Fire Truck is a great gift for kids aged 3+. Collect all the Ultimate Rescue vehicles and go on exciting new adventures with the PAW Patrol! Includes: 1 Ultimate Rescue Fire Truck, 1 Mini Fire Cart, 1 Marshall Figure, 4 Projectile Launchers, 1 Ladder, 1 Sticker Sheet & 1 Instruction Sheet.